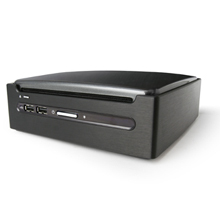 AOpen miniPC Duo MP965-D is the latest version of the miniPC Duo series and the smallest desktop PC in the world. It is built on the latest Intel Santa Rosa Refresh platform which uses the GM965 chipset and equips one of Intel's new 64-bit Socket P Core 2 Duo processors. It will give you breakthrough performance and outstanding responsiveness. AOpen miniPC is the smallest PC in the world and just 165 x 165 x 50mm (about 1.36 liters) in size. Comparing to regular computer, MP965-D is compact with stylish design. PCs are no longer big figure and cold feeling. With MP965-D, there are more rooms on your desktop. The small boards provide a DC adapter for convenience when using in different conditions. 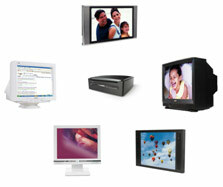 Thus, it is the best choice for small form factor PC Solution. For the extend ability; AOpen mini PC Duo MP965-D has high speed networking, Bluetooth 2.0, Remote Controller, four USB 2.0 ports and one IEEE 1394 port. AOpen MP965-DR also supports dual mini Card slots, where you can install Wireless LAN, TV tuner or Turbo Memory cards, to extend system capabilities with minimal space and power requirements.